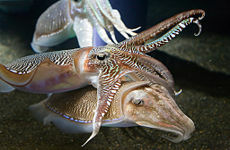 Cuttlefish are squid-like marine mollusks comprising the cephalopod order Sepiida, characterized by an internal shell (cuttlebone) on their back, large W-shaped pupils, and a total of ten tentacles and arms (eight arms and two tentacles furnished with denticulated suckers). Despite their common name, cuttlefish are not fish but members of the invertebrate phylum Mollusca. They belong to the same cephalopod subclass Coleoidea with octopuses and squids. In some classifications, cuttlefish are placed in the order Sepioidea, but monophyly of this order is not supported (Zheng et al. 2004). 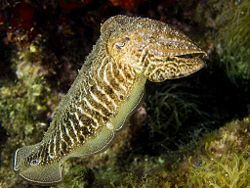 Cuttlefish are remarkable in their ability not only to rapidly change colors, color patterns, and color intensity to blend with its background, but even change skin texture to match its habitat, better concealing itself as its moves among the various sandy areas, corals, and rocks of its marine environment. Recent studies indicate that the cuttlefish and octopus are among the most intelligent invertebrate species. Ecologically, the carnivorous cuttlefish are important in marine food chains, preying upon small mollukcs, crabs, shrimp, fish, and other cuttlefish, while being preyed upon by dolphins, sharks, fish, seals, and other cuttlefish. For humans, in addition to adding to the wonder of nature, they are important in behavioral and neurological research given their highly-developed nervous system, brain, and eyes. 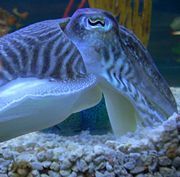 The cuttlebone of cuttlefish offer addition values, including use as a source of calcium for caged birds and use as molds by jewelers and silversmiths for casting small objects. There are hundreds of cuttlefish species, inhabiting diverse marine habitats. Their life expectancy is about one to three years. Cuttlefish are members of the Mollusca phylum, a taxon that includes such familiar animals as snails, clams, oysters, mussels, nudibranchs, abalones, and octopuses. Together with squid, octopus, and nautilus, cuttlefish belong to the mollusk class Cephalopoda, whose members, all marine in habitat, are characterized by bilateral body symmetry, a prominent head, and a modification of the mollusk foot into the form of arms or tentacles surrounding the mouth. Cephalopods have the most complex nervous system among invertebrates, and large and image-focusing, vertebrate-like eyes. The highly developed neural organs allow them to have an excellent capacity to learn and remember; nonetheless, most are short-lived, in the order of months or a few years. The class Cephalopoda contains two extant (living) subclasses. Cuttlefish belong to the subclass Coleoidea, along with octopuses, squids, and the extinct belemites. Members of Coleoidea are characterized by the mollusk shell being internalized or absent, as opposed to members of the subclass Nautiloidea, whose members are characterized by an external shell. Among the extant Coleoidea, cuttlefish are distinguished from the octopuses by the cuttlefish having eight arms and two tentacles, while octopuses have eight arms and no tentacles. (Tentacles tend to be longer than arms and usually have suckers as their tips only.) Squids also, at some point in their life cycle, have eight arms and two tentacles. Cuttlefish differ from squid in that cuttlefish have an internal shell (cuttlebone) on their back. Cuttlefish comprise order Sepiida (ITIS 1999). Within Sepiida, there are two extant families, Sepiadariidae and Sepiidae (ITIS 1999). Some taxonomies list the cuttlefish as part of the order Sepioidea, which is made up of five families, including Sepiadariidae and Sepiidae, as well as Sepiolida (bobtail squid), Spirulidae, and Idiosepiidae. However, molecular studies have not been able to confirm the monophyly of Sepioidea, and various authorities have broken down the five families variously into two, three, four, and even five orders (Zheng et al. 2004). Mitochondrial cytochrome c and rRNA gene studies have reflected that Sepiolidae and Sepiidae should be in different orders and thus Sepioidea not a natural order (Zheng et al. 2004). Cuttlefish possess an internal structure called the cuttlebone (or cuttlefish bone). The cuttlebone, which is a chambered and gas-filled shell, is unique to cuttlefish and one of the features contrasting them with their squid relatives. The cuttlebone is porous, composed primarily of calcium carbonate, and with a structure consisting of narrow layers connected by numerous upright pillars. The cuttlebone provides the cuttlefish with buoyancy control, with buoyancy regulated by changing the gas-to-liquid ratio in the chambered cuttlebone. Each species of cuttlefish has a distinct shape, size, and pattern of ridges or texture on the cuttlebone. Depending on the species, cuttlebones implode at a depth of between 200 and 600 meters. As such, most species of cuttlefish live on the seafloor in shallow water, usually on the continental shelf (Norman 2000). In the past, cuttlebones were used in making polishing powder. The powder was added to toothpaste and used as an antacid or as an absorbent. Today, cuttlebones are commonly used as calcium-rich dietary supplements for caged birds and turtles (Norman and Reid 2000). In addition, because the cuttlebone is able to withstand high temperatures and also be easily carved, it makes for an ideal mold-making material for small metal casting. Jewelry and small sculptural objects can be produced quickly and economically. Jewelers prepare the cuttlebone for use as a mold by cutting it in half and rubbing the two sides together until they fit flush against one another. Then the casting can be done by carving a design into the cuttlebone, adding the necessary sprue, melting the metal in a separate pouring crucible, and pouring the molten metal into the mold through the sprue. Finally, the sprue is sawed off and the finished piece is polished. 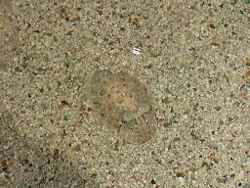 An infant cuttlefish protects itself with camouflage. With the exception of Nautilus, cephalopods have special skin cells called chromatophores that change color and are used for communication and camouflage. Cuttlefish have a remarkable ability to rapidly alter their skin color at will. Their skin flashes a fast-changing pattern as communication to other cuttlefish and to camouflage from predators. They can change rapidly as they swim over different environments, reflecting even the pattern of their surroundings. This color-changing function in cuttlefish is produced by groups of red, yellow, brown, and black pigmented chromatophores above a layer of reflective iridophores and leucophores, with up to 200 of these specialized pigment cells per square millimeter. The pigmented chromatophores have a sac of pigment and a large membrane that is folded when retracted. There are six to 20 small muscle cells on the sides that can contract to squash the elastic sac into a disc against the skin. Yellow chromatophores (xanthophores) are closest to the surface of the skin, red and orange are below (erythrophores), and brown or black are just above the iridophore layer (melanophores). The iridophores reflect blue and green light. Iridophores are plates of chitin or protein, which can reflect the environment around a cuttlefish. They are responsible for the metallic blues, greens, golds, and silvers often seen on cuttlefish. All of these cells can be used in combinations. For example, orange is produced by red and yellow chromatophores, while purple can be created by a red chromatophore and an iridophore. The cuttlefish can also use an iridophore and a yellow chromatophore to produce a brighter green. As well as being able to influence the color of the light that reflects off their skin, cuttlefish can also affect the light's polarization, which can be used to signal to other marine animals, many of which can also sense polarization. Cuttlefish and octopuses are also noted for the ability to change the texture of their skin to match their environment, such as having bumpy projections when over a coral reef or smooth skin when over sand. Although cuttlefish are known as "chameleons of the sea" for their ability to change skin color and patterns, the cuttlefish color changes are actually much faster and more intricate than that of the chameleon, changing as they swim over different surfaces. A close up of a cuttlefish eye. Cuttlefish eyes are among the most developed in the animal kingdom. Like vertebrates, cephalopods can focus their eyes, and their vision is acute. Surprisingly in light of their ability to change color, they probably are color blind (Hanlon and Messenger 1996; Mäthger 2006). Evidence of color vision has been found in only one species of cephalopod, the sparkling enope squid (Hanlon and Messenger 1996). When camouflaging themselves, cuttlefish and octopuses use their chromatophores to change brightness and pattern according to the background they see, but their ability to match the specific color of a background probably comes from iridophores and leucophores that reflect light from the environment (Hanlon and Messenger 1996). The cuttlefish pupil is a smoothly-curving W shape. Although they cannot see color, they can perceive the polarization of light, which enhances their perception of contrast. They have two spots of concentrated sensor cells on their retina (known as fovea), one to look more forward, and one to look more backwards. The lenses, instead of being reshaped as they are in humans, are pulled around by reshaping the entire eye in order to change focus. Superficial similarities between cephalopod and vertebrate eyes are thought to be examples of convergent evolution. Scientists have speculated that cuttlefish's eyes are fully developed before birth and start observing their surroundings while still in the egg. The blood of a cuttlefish is an unusual shade of green-blue because it uses the copper-containing protein hemocyanin to carry oxygen instead of the red iron-containing protein hemoglobin that is found in mammals. The blood is pumped by three separate hearts, two of which are used for pumping blood to the cuttlefish's pair of gills (one heart for each gill), and the third for pumping blood around the rest of the body. A cuttlefish's heart must pump a higher blood flow than most other animals because hemocyanin is substantially less capable of carrying oxygen than hemoglobin. As with other cephalopods, the primary method of movement of cuttlefish is by jet propulsion, a very energy-consuming way to travel compared to the tail propulsion used by fish. Cuttlefish can move short distances in any direction by rippling of a flap of muscle around the mantle. There are over 120 extant species of cuttlefish currently recognized, grouped into two families (Sepiadariidae and Sepiidae) and five genera. Sepiadariidae contains seven species and two genera; all the rest are in Sepiidae. Cuttlefish are popular as a food in various countries, and particularly in Japan, India, and many Mediterranean countries (Herbst 2001). It is more tender than squid and octopus, but still must be tenderized before cooking in order not to be too chewy (Herbst 2001). 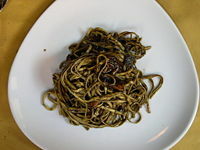 Although squid is more popular as a restaurant dish all over the world, in East Asia dried shredded cuttlefish is a highly popular snack food. Sarume is cuttlefish that has been seasoned and roasted (Herbst 20010. Cuttlefish is especially popular in Italy, where it is used in Risotto al Nero di Seppia (literally black cuttlefish rice). The Croatian Crni Rižot is virtually the same recipe, which probably originated in Venice and then spread across both coasts of the Adriatic. "Nero" and "Crni" mean black, the color the rice turns because of the cuttlefish ink. Spanish cuisine, especially that of the coastal regions, uses cuttlefish and squid ink for the marine flavor and smoothness it provides; it is included in dishes such as rice, pasta, and fish stews. Hanlon, R. T, and J. B. Messenger. 1996. Cephalopod Behaviour. Cambridge: Cambridge University Press. ISBN 0521645832. Integrated Taxonomic Information System (ITIS). 1999. Sepiida Zittel, 1895 ITIS Taxonomic Serial No. : 82331. Retrieved August 1, 2008. Mäthger, L. M. 2006. Color blindness and contrast perception in cuttlefish (Sepia offcinalis) determined by a visual sensorimotor assay Vision Research 46(11): 1746-1753. Retrieved August 1, 2008. Norman, M. D. 2000. Cephalopods, A World Guide: Pacific Ocean, Indian Ocean, Red Sea, Atlantic Ocean, Caribbean, Arctic, Antarctic. Hackenheim, Germany: ConchBooks. ISBN 3925919325. Norman, Mark Douglas, and Amanda Louise Reid. 2000. Guide to Squid, Cuttlefish and Octopuses of Australasia. Collingwood, Vic: CSIRO Pub. ISBN 0643065776. O'Shea, S., and K. Bolstad. 2008. Giant squid and colossal squid fact sheet Tonmo (The Octopus News Magazine Online). Retrieved August 1, 2008. This page was last modified on 13 August 2008, at 21:59.